A lemon sponge filled with Sicilian lemon curd with tangy lemon frosting in the middle and on the top. 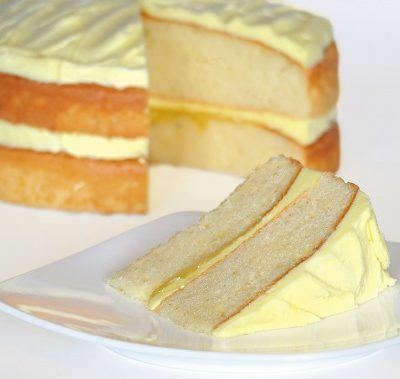 Frosting (25%) (Icing Sugar, Vegetable Margarine (Palm Oil, Rapeseed Oil, Water, Emulsifier: E471), Water, Vegetable Oil (Palm Oil, Rapeseed Oil, Emulsifier: E471), Skimmed Milk Powder, Glucose Syrup, Natural Lemon Flavouring, Modified Waxy Maize Starch, Emulsifiers: E477, E471, E475; Stabiliser: E415; Salt, Colour: E161b), Sugar, Wheat Flour (Wheat Flour, Calcium Carbonate, Iron, Niacin, Thiamin), Egg, Rapeseed Oil, Water, Cake Concentrate (Modified Starch (Waxy Maize, Potato), Wheat Starch, Raising Agents: E450(i), E501; Wheat Flour (Wheat Flour, Calcium Carbonate, Iron, Niacin, Thiamin), Emulsifiers: E471, E477, E481; Rapeseed Oil, Glucose, Preservative: E202; Wheat Protein, Acid: E330; Stabiliser: E415), Lemon Curd (3%) (Liquid Sugar, Glucose Syrup, Palm Oil, Modified Waxy Maize Starch, Acidity Regulator: E330, E331; Lemon Juice Concentrate (1.2%), Whole Egg Powder, Gelling Agent: E440; Natural Flavouring, Preservative: E202; Colour: E160b), Humectant: E422; Flavouring, Raising Agents: E450(i), E501(ii); Colour: E161b. Made in an environment where other gluten containing cereals, soya, nuts, sesame and mustard seeds are used.